Increase number of reviews again? Usually, only 20 reviews per day is allowable. I know, there are lot of badges bugs today - is this a same problem with SQL queries? Or it's some moderation research again? Since the queues weren't being filled properly, when this was corrected the queue would have received a sudden influx of reviews and it would have pushed the queue over the threshold which enables reviewers 40 reviews a day instead of 20. As the queue was cleared the number of items to review would have fallen below that threshold putting reviewers back to the traditional 20. 1, 2, 3…test. Let’s increase the number of reviews & close votes for science! Where are the reviews at? No more reviews for today, for close vote Why? 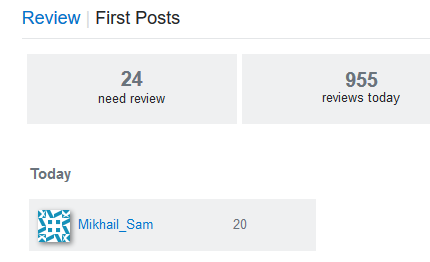 Can the limit of 20 reviews per day be increased as you gain experience? Why does the max # of reviews in Low Quality Posts review queue bump to 40 without reaching the queue size 1k? How can a user have more Late reviews than the current limit? I am only able to review 20 Low Quality Posts. What happened?